The first new lodge to be built in the Yosemite area in more than 25 years, Rush Creek embodies a contemporary, rustic sensibility inspired by the breathtaking expanse of nature surrounding its 20-acre wooded hillside setting. Having hosted weddings for over a decade at our neighboring sister property, the Evergreen Lodge, we appreciate that every wedding party has specific needs, and we’re happy to work with you on lodging options, budget realities, meal options, facilities choices, recreation ideas, and more. You can rely on our flexibility and creativity in realizing the celebration of your dreams. We reduce the pressure of planning, giving you more time to enjoy your guests and the beauty that surrounds you. We can arrange additional enhancements, including table decorations, specialty linens, floral service, cake service, archway, dance floor, and DJ. We can also deliver gift baskets and wedding mementos for your guests. Our on-site planning and catering experts can design all of your meals to suit your party’s budget and dietary realities. As with the rest of your event, we’ll focus on crafting menus and presentations that help realize your vision. Options range from “backpacker” lunches (for your day hike) to a variety of buffets to “mountain elegant” plated reception dinners. Please contact our Weddings Coordinator for menu options, pricing, and further details. Our grand main lodge houses our main dining room, tavern, and adjoining terraces. The main dining room and terrace can seat groups up to 220, and for a more intimate occasion, our private dining room and terrace can accommodate banquets of up to 60 guests. Note: all food & beverage for your event is provided by the Lodge, with exception of the wedding cake. Wedding ceremonies can take place at a variety of idyllic outdoor venues or in our main event hall. We are thrilled to bring this magnificent event hall to the Yosemite area! With its high-beamed ceilings, massive picture windows, and walls that slide completely open to let the outdoors in, you’re free to enjoy the best of all worlds. Couples can also have their ceremony in the Park and return to the Lodge for their reception. Our main restaurant, private dining room tavern, and spacious outdoor terraces provide groups with great flexibility for both their functions and their leisure time. Rehearsal dinners and brunches can be held in any of our several venues. To reserve a date, a non-refundable deposit of the facility rental fee is due within 14 days after booking your date. An additional $1,000 non-refundable deposit is due at 90 days out from the event. At 30 days an additional deposit is due equal to 50% of the estimated invoice balance. The remainder is due at checkout. We require a two-night minimum rental on lodging. so we can arrange to discuss your needs and check availability of your desired date. For rental of additional items for your event that Rush Creek Lodge does not have in-house, we are happy to coordinate rental of any of the items listed below. For our services, which include coordinating delivery and covering associated costs, we charge a fee of 10% of the rental costs as listed below. Farm Tables and Chairs are included in the facility fee for meetings, receptions, and ceremonies of up to 200 people. Additional tables will be rented from an outside vendor, pricing varies. This list of vendors is supplied as a courtesy; Rush Creek Lodge cannot be held responsible for arrangements or accuracy of information. All arrangements and fees are made directly with the individuals. Gather your wedding party, family and friends for a private guided tour customized to fit your schedule and group interests. We can tour Yosemite Valley, the Yosemite High Country, or Glacier Point. This is a great opportunity to spend quality time with your wedding guests while also enjoying the special area where you chose to get married. We can customize outings to include short hikes, visits to photo locations and even a champagne toast at a scenic vista or The Ahwahnee. Freshly made trail lunches are included in the trip. Come see and explore one of Yosemite’s best kept secrets: Hetch Hetchy or Carlon Falls. Both are absolutely beautiful areas, and both are close to the lodge and seen by few. 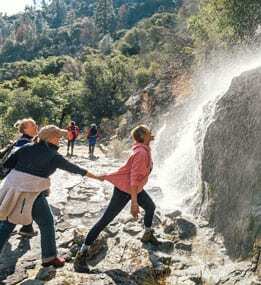 Our hike to Hetch Hetchy’s Wapama Falls is 4.5 miles roundtrip, while Carlon Falls is about 3 miles – both are modest hikes. At its peak, Wapama Falls is the most powerful waterfall in Yosemite and is more than 1200’ high. Carlon Falls in contrast, is an idyllic series of cascading falls with a main swimming hole at its base. Both spots are ideal for a picnic lunch (which is included in the trip) and hanging out before your big event. These are great trips to spend quality time with a smaller, select group of friends and family. Our guide typically leads the carpool caravan to the trailhead, which is either a 10 or 20 minute drive from the lodge depending on the trip (van transportation can also be arranged for an additional fee). Breathe in the rare beauty of Yosemite in this 4 ½ hour hiking and yoga adventure. This spectacular morning journey will bring relaxation and serenity as we settle into the rhythms of the wilderness. The perfect start to balance your special wedding weekend, our journey begins with a two and a half mile hike to Lookout Point, where breathtaking views of Wapama Falls and Tuolumne Canyon await. Once at our destination, we will enjoy a gentle hatha yoga session in the morning mountain air. Following the professionally led yoga practice, we’ll rest and enjoy a snack before beginning our walk back to the lodge. Beginning in the high peaks of Southern Yosemite, the Merced River is best known for creating the spectacular Nevada and Vernal Falls before it enters Yosemite Valley. Further downstream we offer an 11 mile whitewater trip, making this a fun and exciting way to cap off the perfect wedding weekend! Whether you choose to open this adventure to all of your wedding guests or would rather give this as a special gift to your wedding party, the class 3 rapids (rated 1-5) are suitable for first time rafters and children over the ages of 12. Low water family trips, great for ages 6 and above, begin in the late season and offer fun technical rapids as well as stops along the way for swimming opportunities, sunny beaches, rock diving boards and snacks! Trips include all river gear for a fun and safe trip, beverages at the end of the trip, parking at launch site and shuttles back to your car. and she'll get you moving in the right direction! All trip start and end times are flexible based on the needs of the wedding party. Trips can be planned and paid for in a variety of ways. Ask about hosted and non-hosted trips. Guests must sign up for trips 30 days ahead of time. 50% non-refundable deposit is due at time of booking. Kids 12 years old and younger are charged half price on most guided trips. To receive more information about Rush Creek Lodge hosting your Wedding, please click here.